The holidays mean holiday baked goods in the pastry case at most bakeries and coffee shops. 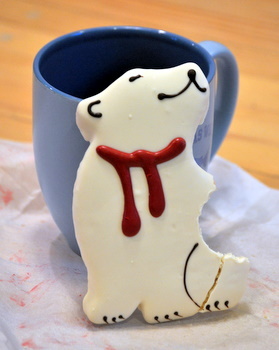 I’ll always prefer homemade baked goods but I couldn’t resist tasting this cute little polar bear cookie from Starbucks. 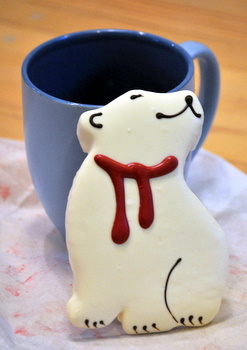 It is a crisp butter cookie coated with a white chocolate-like glaze. It’s a good flavor combination and not too sweet, but even though I enjoyed it, you’re buying it for looks and not just for its flavor. Maybe it’s a decorating idea I’ll end up trying at home!